Couple of days ago, HP Helion is announced and I posted that I will take a look at it. I found some time to test it and here is review. I will try to compare it with pure Openstack by explaining the installation steps with my comments. A – Before doing anything. When I am reading the documentation of Helion, I was hoping that it will be easy process and does not depend lost of weird things. Firstly, You need to have a physical computer in order to install HP Helion. There will be created 4 virtual machines at first, so you need to have minimum of 16 GB Memory and Virtualization enabled CPU. The disk size should be minimum of 80 GB just for test. After installation of the system, it consumed 74 GB of my hard drive. It is obvious that a physical server needed for this setup, because 4 virtual servers will be created in it. My hopes was to install them directly to OS as a package. The second thing is that your physical server’s OS needs to be Ubuntu 13.10 or 14.04. HP wrote that it can support others but not tested. I installed on 14.04, unfortunately it comes with biosdevname package, because of that this package interface card’s name renamed to p1px which Helion does not support. As documentation mentioned I needed to replace card names to eth name template. HP put all system in a 4GB sized compressed file, it includes 4 virtual machine disks, and scripts to start them. These virtual machines are: Seed, Undercloud, Overcloud Controller, Overcloud Compute. Typical TripleO setup. If you have a different network and do not have networking skills or rights on hardware, you need to install a desktop environment on your physical server in order to connect to the dashboard. I suggest to install lxde and xrdp. You can connect your physical server by using Remote desktop. When you saw “completed setup seed” text, it is done. After script run successfully, you will see “HP – completed” text. C – Specifications and Usage. Now what? We can use console commands or connect to dashboard to test it. HP documentation already shows CLI commands which are pure Openstack anyway. I will try to review the dashboard. If you connect your physical server to remote client, you will have trouble connecting the dashboard. You need to at least use 192.0.2.0/24 subnet on your network envrionment in order to use dashboard. The workaround is to install a desktop environment to physical server as I mention above. Connect to your physical server’s desktop, open a browser and enter to 192.0.2.23 which is the overcloud controller IP. You will see the HP Helion login screen. You need to find the admin password. The passwords are created by scripts in seed vm. Open the tripleo/tripleo-overcloud-passwords file and note the OVERCLOUD_ADMIN_PASSWORD. When comparing it with pure Openstack, there are just visual differences, I guess that HP just changed the template of the Horizon. 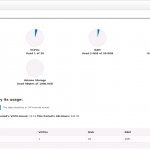 There are no Load balance and Firewall services in Helion. I do not know if they are hidden or not, but you cannot enable them. I cannot see Groups and roles pages on Identity panel in the dashboard. They need to enable keystone v3 on dashboard, or they do not want to. 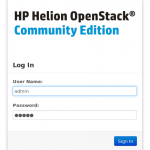 HP Helion is really easy to install if you have ability to manage Ubuntu server, it is not for beginner’s job. There are still couple of minor problems needs to be fixed. Helion is visually customized, configuration locked, quickly deployed, pure Openstack installation which has long way to be enterprise level installations.